New this month: ask a metastatic expert anything, cycling for ovarian cancer, & more! Save the Date for Ovarian Cycle NYC! 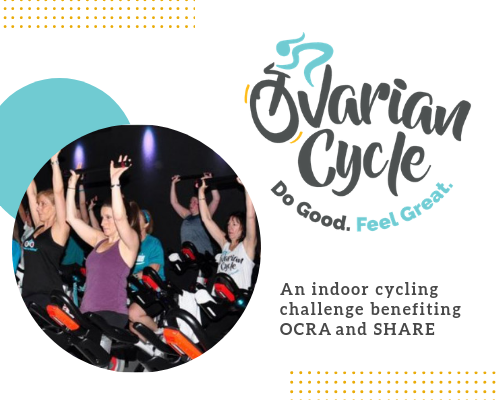 Join SHARE and the Ovarian Cancer Research Alliance (OCRA) on May 4 for Ovarian Cycle NYC, a fun and exciting indoor cycling challenge! 50% of funds raised from this event will benefit SHARE's work of providing free peer support and education to women and their families affected by ovarian cancer. Learn more, including how you can support Team SHARE, by visiting here. Thank you to everyone who attended our recent program on conflicts of interest in breast cancer research and treatment. MDEdge, a hematology and oncology publication, wrote an excellent recap of the event here. Whether you're buying gifts or everyday items, you can support SHARE by shopping on Amazon.com through AmazonSmile. When you purchase your items, Amazon will automatically donate a portion of your proceeds to SHARE. Click here to get started.